UPDATE (9th September 18:17 BST): CoinMKT’s public beta version is now live. CoinMKT, a new cryptocurrency exchange, is launching its public beta on 3rd September. Founded by Travis Skweres, the company is aiming to be the first US based exchange that will enable the trading of seven digital currencies. Users will also enjoy commission-free trading for the first month. “What we really want to do is provide a more seamless experience where the user never has to leave our site, similar to Coinbase. Think: Coinbase’s easy bank linking process, but not just bitcoins … six different cryptocurrencies,” Skweres told CoinDesk in June. * KYC = “Know your customer”, and AML = “Anti-Money Laundering”. 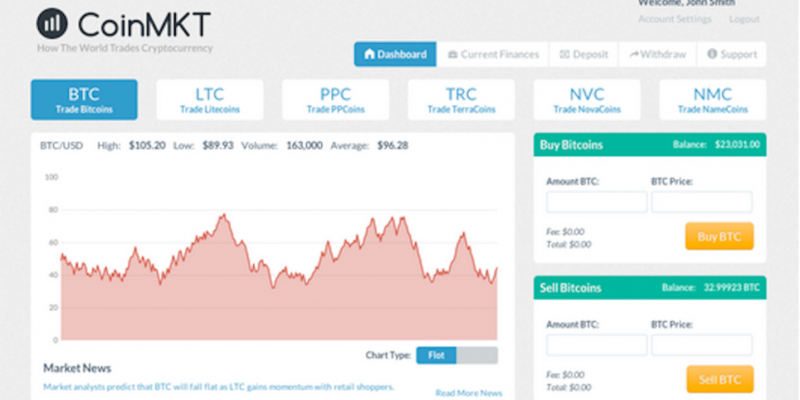 Originally, CoinMKT was known to support six currencies: bitcoin, Litecoin, PPCoin, NovaCoin, TerraCoin, and NameCoin. However, we have received word from the Feathercoin community that its currency will also be included in CoinMKT’s offerings. Feathercoin’s John Manglaviti reported that at the New York City Bitcoin conference, he’d been shown an early beta version of CoinMKT that included the Scrypt based currency. CoinMKT has said it will accept deposits and withdrawals from US customers via Dwolla, but international customers will have to use wire transfers to deposit into their account. Additionally, verified customers will be able to withdraw up to $50,000 per month. Of course, such numbers draw attention to liquidity. “We have been speaking with investors and the conversations are going well, but we are bootstrapped up until this point, so liquidity and building the order book will be our main focus as we move forward in the short term,” Skweres told us. The exchange could prove popular in the US, given that the only other exchange that allows for trades of fiat funds against bitcoin and altcoins is BTC-e. Many people are avoiding Mt. Gox, which currently only trades in bitcoin, as it has been beset with problems when it comes to the withdrawal of fiat funds. The other notable altcurrency exchange is BTER, however, this only trades altcurrencies against each other and does not allow for fiat trading.